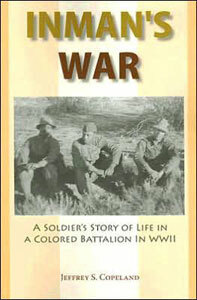 Individual, personal accounts of life and service in what were called the “Colored Battalions” are almost non-existent. Those who served in these battalions were unsung heroes of the Allies’ fight for freedom and rights for all, yet they were often sacrificed along the way to attaining those goals. At long last, their story is told. Listen to an interview with me on National Public Radio (KWMU) talking about the book. Read an in-depth article about Inman’s War in the ALAN Review Magazine. “Jeffrey Copeland discovered hidden treasure when he found a suitcase full of letters written during WWII. Inman’s War, which is based on those letters, is a wonderful read, filled with laughter, tears, anger, love, and friendship.”—Sally Walker, author of Written in Bone: Buried Lives of Jamestown and Colonial Maryland. “Inman’s War offers an intensely personal look at individual valor and suffering, and allows lay readers and historians alike to appreciate the contribution of ‘colored battalions’ not only to the war effort, but to the improved egalitarianism of American Culture. Highly recommended reading.”—The Midwest Book Review.